Reach a Year’s Worth of Customers in 4 Days! Del Mar…”We Love This Show!” say the regular exhibitors at the 41-year-old Fred Hall Del Mar Show. This is one of the premiere shows in the nation. San Diego is California’s second largest city and the nation’s fifth most populous county. 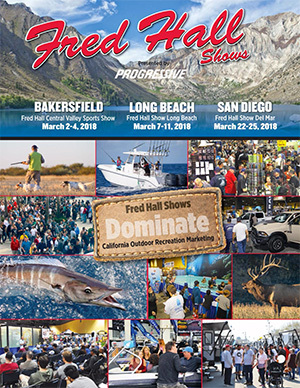 This show is San Diego’s biggest fishing show, biggest boat show, biggest travel & hunting show and biggest outdoor recreation event of the year. The Fred Hall Del Mar Show has continued to set attendance records every year. It is the last show of the season for many destination resorts and outdoor recreation companies and the results for exhibitors can be spectacular.